Hagerty is known for the efficiency of its products for cleaning the house. Hagerty is also the specialist of cleaning silver, silver metal, gold through a complete line of cleaning products. Here are some tips to clean and maintain your silverware that our house specializes in the restoration of ancient silverware tells you. 1 - Do not use aggressive cleaning products which may rub off the silver-plating or scratch the surface. 2 - DO NOT use vinegar, salt, egg yolk or rubber bands. 3 - Do not use polish on objects which will come into contact with food. 4 - Avoid polishing ornamental objects: with time, the polish can flake off and allow air in which cause underlying oxidation. 1 - Use soft moistened cloth for moderately dirty objects (e.g. yellowing). 2 - Use products designed for silver and silver plating. 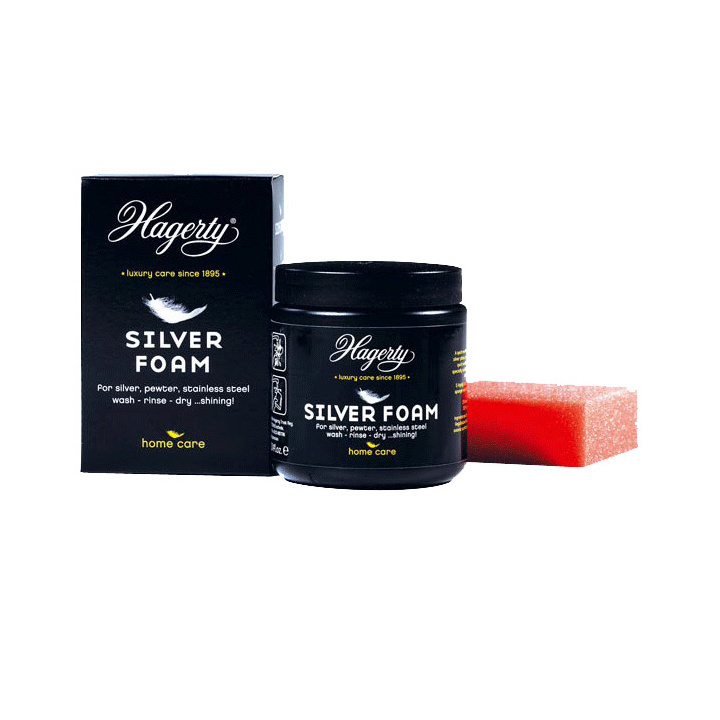 We strongly recommend the following Hagerty products: Hagerty® Silver Care and Silver Gloves, which are available in our online shop. 3 - Rinse off the product with soapy water after cleaning. 4 - If the item is heavily tarnished, you may have to have it professionally cleaned. Should you use a dishwasher? Silver cutlery can be cleaned in a dishwasher as long as you use powder detergent (avoid tablets and gel detergent). However, please ensure that the knife handle cement is resistant to heat. If necessary, the restorer can make any knife dishwasher proof. If flatware is housed in special cases, pouches or fitted drawers, they will oxidize less and require less maintenance. Such storage solutions also prevent friction, protect the silver, facilitate every day or occasional use, and make transportation easier. Your flatware is worth a suitable storage solution. Discover our array of storage solutions in our online shop.